Things to Consider Before You Start Trying to Sell by Yourself! Save thousands of dollars listing your home on the Multiple Listing Service. Thinking Of Selling Your Own Home? Information You Need to Know. You might get lucky and save a buck or two. 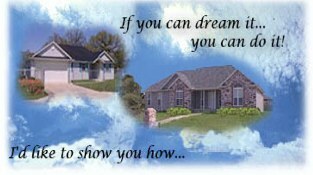 A lot of folks have tried to sell their own homes and succeeded. A lot more have just tried. Market demand, seasonality of sales, location, and many other variables often alter your home's value. The first thing I can do for you is recommend a fair and reasonable asking price. Do it yourself and you will probable ask too much or too little. Don't be fooled by believing you know what your home is worth. As a skilled real estate professional, I know all about these things, and most important, I know buyers and agents that have buyers. YOU'RE FAIR GAME FOR ALL TYPES OF CALLERS! If you love talking to strange people at strange hours, by all means, sell your home yourself. That "For Sale By Owner" sign in your front yard means you're fair game for everyone, even those passersby who "just wanted to see what the place looked like". That sign may not get all the prospects you want, either. You may have to advertise. And that means getting phone calls at all hours. I can solve these problems. First of all, I will "screen" prospects. Finding out their needs, desires, and financial situations. Separating those who are seriously looking for a new home from those who are just looking. Best of all, I will only show your home when it is convenient for you. THAT BEAUTIFUL ART OF SALESMANSHIP! Okay, Tiger. You're selling your own home. You know the needs and desires of your prospective buyers, and you know what to say, how to present your home to convince them, right? I am trained in the art of salesmanship (and believe me, it's an art). My study of sales techniques has shown me how to close the sale. In fact, I've gone to school learn how to do precisely that. After all, selling is what it's all about. What happens when a prospective buyer makes you an offer, one that's well below your asking price? You're going to argue. That's the worst thing you can do. As a principal in the transaction, you'll discover it's pretty hard to bargain with a buyer, to negotiate about such things as price, terms, and possessions. Misunderstandings may crop up, and those small disagreements can spoil a sale. When I help sell your home, I take on the difficult task of negotiation, acting as a sort of go-between and advisor. One who is objective. One who can tell you when the buyer is right or when you should stick to your guns, and one who is usually a heck of a nice person, too. I know how to smooth over, or completely avoid those sale-killing misunderstandings. I also have the benefit of having a professional relationship, built from networking, with the other agent, which will help in the negotiating process. Many prospective buyers don't know much about financing, how or where to get a mortgage. Sell your home yourself and there isn't much you can do to help them. I know the appropriate lenders who know just about all there is to know about financing, and knows how to work closely with all kinds of financial situations, and have had a great track record to see to it that the sale closes without a hitch. Very simply, I can help your buyer find the money needed to buy your house. Selling a house involves many details. Contracts, title search, finance arrangements, legal jargon, escrow details, there are a hundred little things to be done. Unless you have a mind like a computer, you'll need professional help to get everything done and keep it straight. My staff and I will guide you through the tangle of details as painlessly as possible. Crowded closets may make your home look lived-in, but they don't do much for a prospective buyer. Neither does a dripping faucet, unkempt lawn, or loose doorknob. There are dozens of little things you can do to make your home more saleable. I can show them to you and provide the staff or services to help you get your home in excellent shape. I will also provide a home warranty free of charge to take care of the little things that may hinder the sale of your home when the inspection calls for certain repairs, which could end up costing you thousands of dollars and the sale to your potential buyer. Showmanship is all it is cracked up to be! If you would like more information about selling your home or would like some free advice, please don't hesitate to contact me. These are most of the forms you will need to sell and be legal in California and most other states.